This simple quick bread comes together in no time and is packed with flavor! 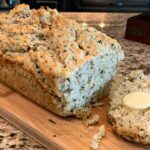 The Herbs really come through in this savory bread making this a tasty must try! Preheat oven to 375 degrees and grease a 9 inch loag pan generously. 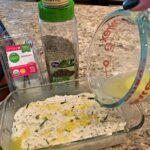 In a medium bowl, combine the flour, salt, baking powder, rosemary, thyme, and Basil. Pour the beer into the mixture and combine. Place dough into the loaf pan and drizzle the melted butter evenly on top. Place pan into preheated oven and bake 45-50 minutes, or until golden brown color. Remove from oven and allow to cool for about 5 minutes prior to serving! Enjoy!